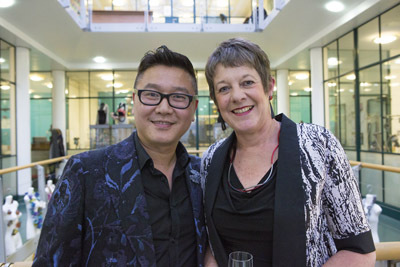 To celebrate his 10th anniversary as a jewellery designer, Fei Liu auctioned four pieces of jewellery and donated the proceeds to Birmingham’s Childrens Hospital, and showcased his bespoke pieces for the first time to the UK market together with the two most popular collections: Cascade and Serenity. The event was organized in collaboration with the School of Jewellery, which marked its 125th birthday and it was held at the premises of the school on Friday October 12th. Three out of four pieces were auctioned on this occasion. Sterling silver, black rhodium plated pendant and drop earrings made as a set from green, eight heart, eight arrow, Cubic Zirconia from limited edition colour Cascade collection. The second item for auction was a sterling silver 12mm Tahitian pearl leaf design brooch. The final jewellery piece, which was auctioned online, is beautiful handmade bespoke 18 carat yellow gold butterfly pendant with 7 carats rubellite and pink sapphire. The acclaimed jewellery designer showcased his bespoke pieces, and among the couture designs were his award winning platinum Kingfisher earrings and tanzanite and diamond necklace which was shown for the first time in the UK. The Kingfisher earrings showcase two excellently preserved Kingfisher feather hair pins dated over 2000 years old. These platinum diamond and turquoise earrings show the antique Kingfisher units to the best advantage whilst preserving them in the original form. The earrings were awarded with the Lonmin Design Innovation Award in 2011. 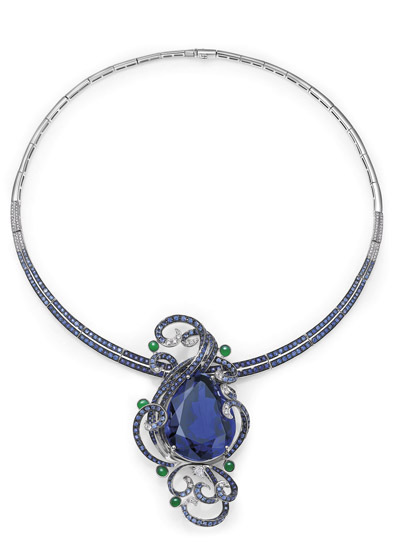 The Tanzanite necklace contains three large tanzanites whose collective weight is over a hundred carats and over 14 carats of white diamonds set into 18K white gold. “I was telling my teacher Maria Hanson, when she had an exhibition in the school that one day I want to have my own show here. I have waited sixteen years to showcase my collection. 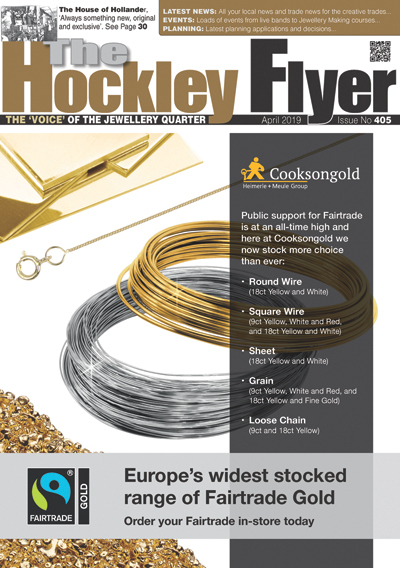 I would like to thank Gaynor and the School of Jewellery for this opportunity. Without the education I received from this school, I would never be able to be where I am today,” Fei Liu said.